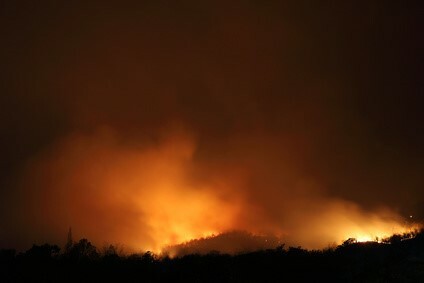 Soot, the byproduct of a fire, whether a raging forest fire or a small kitchen fire, and even from the burning of candles and scents, can pose serious health threats to those who are subject to breathing in the soot particles. It is the product of material that didn’t totally go through the combustion process of burning. The soot found outside after a fire is classified as a criteria pollutant and is regulated by the EPA. 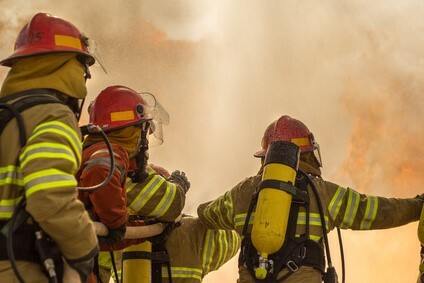 Those who are called in to clean up after a fire is out, such as firemen or cleaning and restoration professionals, understand the dangers involved and how to properly remediate the damage. The majority of consumers may not. Soot is made up of very fine carbon particles that become airborne and can remain airborne for quite some time. These particles can end up in your lungs. You may not even realize it is happening while soot causes damage to your mouth, nose, throat, and, of course, your lungs. Even ‘harmless’ smoke from a fireplace has many chemical similarities to cigarette smoke. Skin contact with soot can be dangerous as well. The International Agency for Research on Cancer says the specific type of hydrocarbons in soot are classified as ‘known human carcinogens.’ Thus, simple contact, not even just breathing in residues, can be potentially harmful. 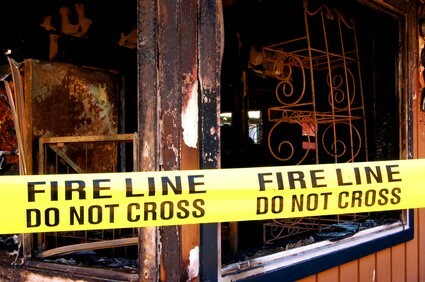 Ventilation of the affected areas is required. Wearing appropriate PPE (Personal Protective Equipment) is a must for the professionals and it should also be for any consumers who plan to do any of the cleanup work themselves. Proper respiratory, skin, and eye protection should be purchased before attempting any cleaning. If the cleanup involves a small fire which is completely out and you are planning to do the cleanup yourself, make sure to use special soot removal sponges on all surfaces before attempting to wash with detergent and water. Soot is oily and oil and water do not mix. Washing will merely spread the soot around. Delicious smelling scents from candles can provide an inviting fragrance in a home. There are hundreds of scents available, from favorites such as vanilla, citrus, lavender, and more. 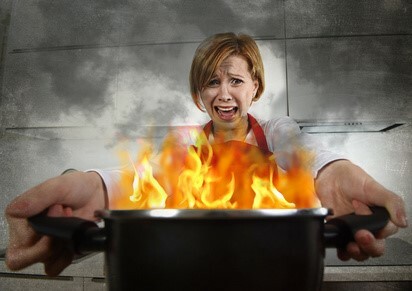 Yet, as inviting as those scents may be, there are some concerns you should consider as you burn them. 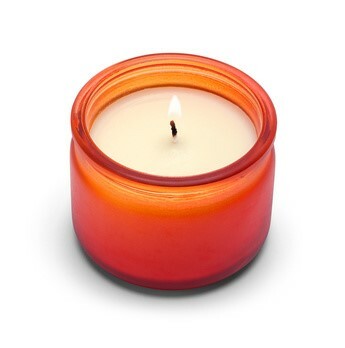 Burning candles can produce pollutants such as acetone, toluene, benzene, and others. These pollutants are also found in soot. It has been noted by various environmental groups and indoor air quality specialists that these scented candles put off smoke, sometimes invisible, that can be leaving an unhealthy residue in your home. If the flame of your candle isn’t totally blue, there is no doubt soot is being produced. 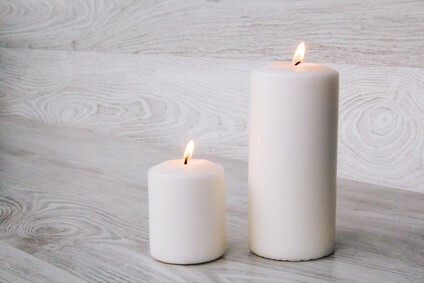 Choose natural wax materials for the candles, such as beeswax or soy, both of which are better choices than wax made from petroleum products and are a safer and healthier choice. Make sure your wick is burning adequately. 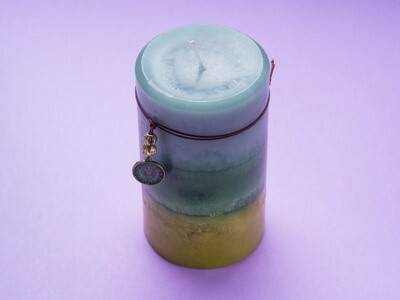 The wick should burn evenly with the melting wax, and curl as it burns. Ensuring the wick is less than ½ inch long when you light it will help. Keep your candles burning where there is limited or no draft. 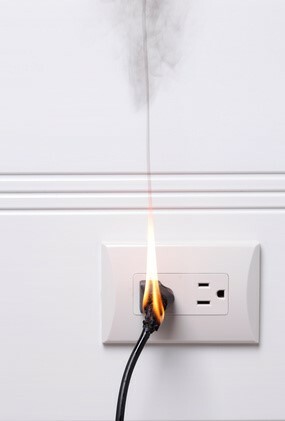 Air movement can cause the flame to burn erratically, possibly creating more soot or pollution. 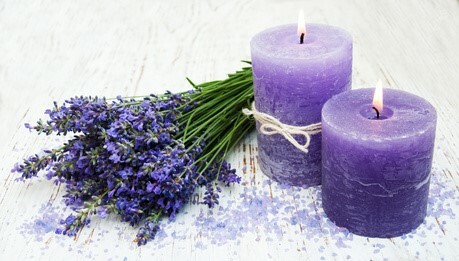 Don’t burn your candles all the time, just when you are in the mood for a nice scent in the home. When you do have issues with candles, such as residue on surfaces in your home, definitely call a professional to help with the cleanup. The carpet in your home acts as a filter. As hot air rises and peaks out at the ceiling tops it is redirected to cooler surfaces, such as the outer walls or another room, and travels down to the carpet. 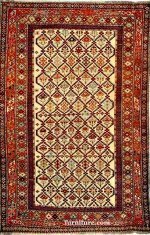 As the air passes through or across the carpet, it carries microscopic particles of dirt, dust, and soot. Some of these soil particles can be the result of fireplace emissions, as well as from cooking oils that have become airborne, cigarette and cigar smoke, burning candles, and even the residue from furniture polish. Soils that are primarily oily can form an electrical bond with the fiber. 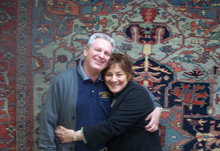 Their size makes it easy for them to attach to the dye sites on the fibers that hold the color of the carpet, making removal extremely difficult or impossible. These oily soils trapped by the carpet will also attract more dry soil. WHAT ARE THOSE DARK LINES ON THE EDGES OF MY CARPET? The airborne soil particles settle and become embedded in the carpet pile yarns, bonding to the fiber. Because the soil is very fine, it can penetrate deeply into the yarns. They produce lines known in the carpet cleaning industry as soil filtration lines, soil lines, smog lines, and perimeter soiling. They are dark, soiled areas that develop gradually on carpeting. WHERE ARE SOIL FILTRATION LINES USUALLY FOUND? 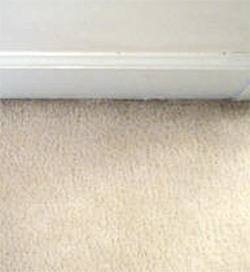 Soil filtration lines are most common around the edges of a room next to the wall, under baseboards, under floor length draperies, under doors, and on edges of stairs. They can develop anywhere there is an air space, such as between floorboards or spaces in the sub flooring under the carpeting. Bedroom doors that are closed at night, especially where windows are left open, are likely to develop the lines as well. WHY ARE OLDER HOMES MORE LIKELY TO HAVE THESE LINES? Older homes with carpet are especially prone to these stains. 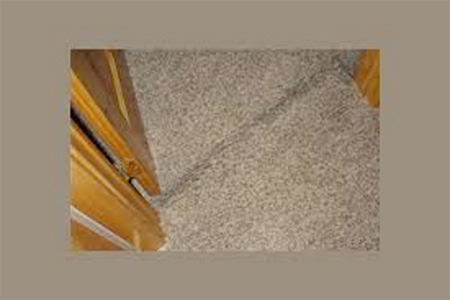 Although thick carpet padding covers most of the floor, there usually isn’t padding at the edges. Instead, there are tack strips to hold the carpet in place and air can seep around the tack strips much more easily than through the thick carpet padding. Modern homes often install caulk, foam or another material between the bottom of the wall framing and the sub floor to minimize drafts and air leaks, making it tougher for the particles to settle. These soil filtration lines, especially noticeable on light colored carpet fibers, are extremely difficult to remove, if not impossible, even after a thorough professional carpet cleaning. If your heating system is a forced hot air one, install high-efficiency air filters and change them periodically. Have your heating, ventilation and/or air conditioning ducts cleaned. Keep doors between rooms open (if possible) so air can move freely through to the rooms rather than going down and into the carpet to avoid a closed door. Do not smoke inside and reduce the burning of candles. 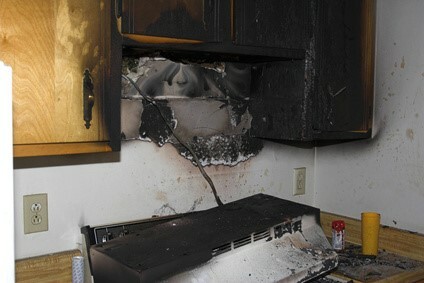 Always use the stove hood vent fan when cooking. Dust thoroughly and vacuum frequently to keep soiling and dust under control. Edge clean the rooms with a crevice tool attachment on your vacuum. This will have the most impact on preventing a buildup. If you replace your carpet, choose a color other than white. For more information on Soil Filtration Lines, please see our article. Although we no longer provide a smoke or fire restoration service, we are still here to answer any questions you might have. We are in the office from 8 to 5 Monday through Thursday, closing at 4:30pm on Fridays. We are also open from 10 to 1 every Saturday. You can call or text us at 607-272-1566 or contact us through Facebook Messenger @ABCOrientalRug.